Personally, when I watch videos and read blogs by my favorite beauty bloggers I catch myself day dreaming about high end products. I can’t be the only one. The products that I want to try out, but sadly can’t afford right now thanks to life and kids. Not that it upsets me at all. I love my life and kids with all of my being. I do know that I am not the only one that is constantly looking for amazing and affordable makeup products though. Too many times I catch myself thinking that if I had more higher end products my makeup would look flawless, but then I remember that it’s truly about finding what’s right for you and how you apply it. So, I want to do a few blogs about amazing and totally affordable makeup products, starting with some of my favorite everyday face products. Of course, these are just what works for me and my face, but I hope that everyone that reads this either finds a new awesome product to try out or that they take away a few tips on finding these products for even cheaper than they already are. 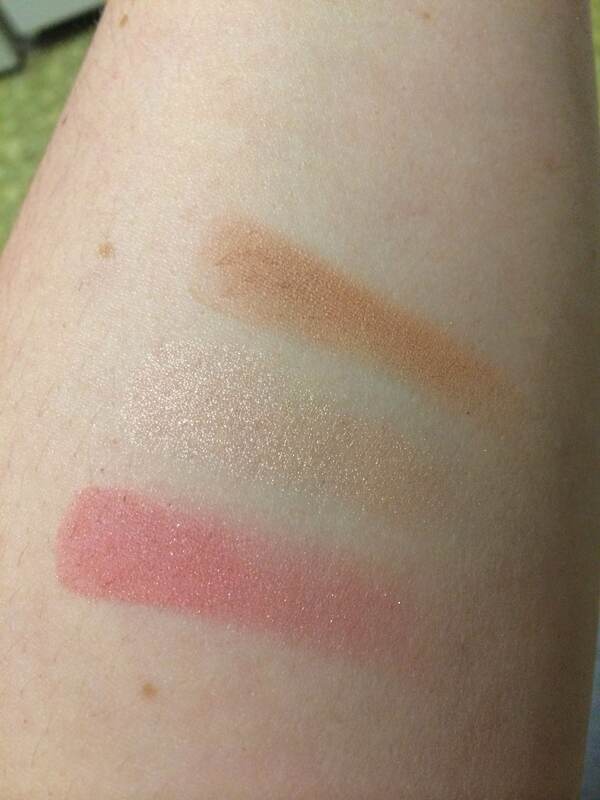 I will also include a separate picture of swatches for the blush, highlighter, and bronzer at the end of the post. Wet n Wild blush in “Pearlescent Pink” – Holy grail blush. I use this blush almost everyday. That’s why the packaging looks kind of dirty. It’s the perfect shade of pink for me and has the slightest hint of shimmer. It’s so beautiful, and a shade that would work on many skin tones. These retail alone at around $3 most retail stores, which is incredible by itself, but I find these on sale so often at CVS and Walgreens. Wet n Wild also releases coupons in the newspaper often, so if you’re a coupon clipper (raises hand!) keep an eye out for them. I have scored so many free Wet n Wild products stacking sales with coupons. LA Girl Pro Concealer– if you follow many youtubers and bloggers, chances are you have heard others raving about this very product. It’s so amazing and I just got it myself a few months back. I have horrible dark circles due to being extremely pale and having allergies, and this concealer covers my under eye circles and doesn’t look caked on. I use the lightest shade, obviously. This concealer retails for $5 on the la girls website, but I found mine for way cheaper on ebay. I got 3 tubes for $7. Quick Ebay tip– when buying makeup always make sure you’re buying from a well known buyer with great feedback. Sometimes people are awful and sell fake products. There are a lot of great sellers on there that do sell the real deal for real cheap. 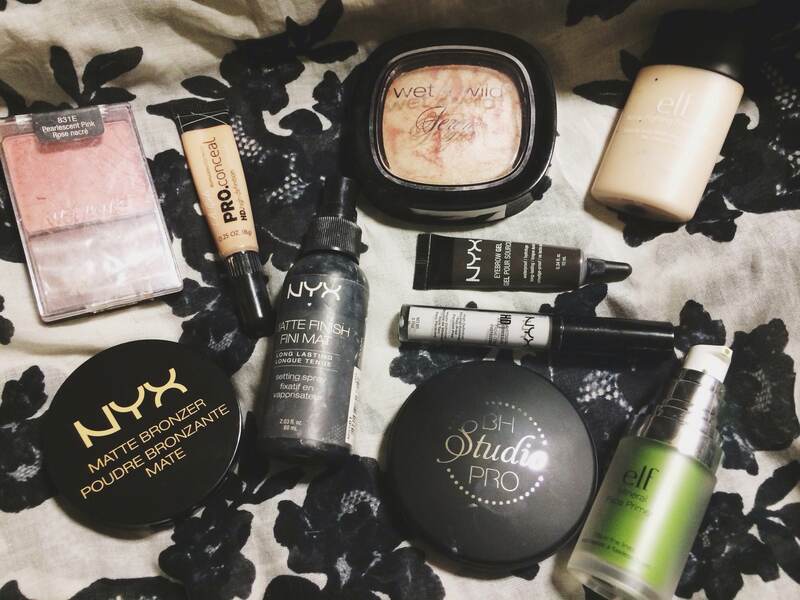 Nyx Matte Bronzer– This is a newer addition to my collection. I have searching for what seems like forever for a flattering contour shade for my skin tone. I typically use Nyx blush in “Taupe” which is amazing as well, but I wanted to switch it up a bit. This line has different shades for different skin tones, so naturally I picked out the shade called “light” that is supposed to be for lighter skin tones. It is a nice bronzer for light skin, maybe a bit on the warmer side for my liking, but a light hand while applying can easily fix that. The packaging is also very sleek and pretty. Nyx Matte Finishing Spray– This has been in my possession for awhile (can you tell by the makeup all over the bottle?) and I love it! It’s perfect for everyday matte makeup looks for me when I want to set my makeup, but I don’t want to use up any of my Urban Decay spray. Wet n Wild Highlighter– This is from the Fergie line in the color ‘Rose Champagne.” It’s so beautiful and affordable. It’s a champagne color with a hint of pink. Super flattering on fair skin. There is so much product in this for the price. I would recommend anyone try this if they are as obsessed with highlighters as I am. I hope the dewy skin look is here to stay. Nyx Eyebrow Gel– I know this is technically not a “face” product, but eyebrows are a must for a complete face look. I’ve been using the black shade from this line for awhile now, and I love it. I still tend to reach for my dipbrow pomade most days, but if I am wanting a very bold brow I reach for this one. It takes the smallest amount of product to do both eyebrows, and it applies so easily. I use an angled brush to apply it. This product does set quickly, but it also stays ALL DAY. It’s an awesome and ridiculously affordable product that I would recommend to anyone to at least try. Nyx HD concealer in “Lavender”– I use this concealer probably everyday. Usually I put this on under my foundation to cancel out the darkness under my eyes. I also use it to lighten up concealer if it’s a bit too dark. It serves multiple purposes, and costs $5. Amazing. Highly recommend for anyone with intense dark circles or is extremely fair and has trouble finding a light enough concealer. Elf Acne Fighting Foundation– This foundation is something that is on my face often. I LOVE this foundation, and I mention it often in my “face of the day” posts. It’s supposed to be blemished skin friendly, but besides that it is also very full coverage and extremely affordable at $6 on the eyeslipsface website. I will say that if you have very fair skin and you don’t have a white mixing agent like the manic panic white dream tone foundation that you may want to hold out on buying it until you have both. The lightest shade on me is a few shades too dark, and I have a to use 2-3 pumps of white to get it to my exact shade, but it’s still an amazing foundation if you’re looking for a less expensive full coverage foundation to add to your life. Elf Mineral Face Primer– The one in the picture is the green toned one, but I also have the plain clear toned mineral face primer. I use the green one on an almost daily basis because it’s supposed to correct red skin. I naturally have a bit of red in my skin on my cheeks, and this helps to correct it a little. Aside from that, it’s $5 (I think) and can be found on elf’s website or in many Target stores. This primer feels amazing on the skin, and the ingredients do not break my skin out whatsoever. Last tip for saving money, especially with all of the holiday things coming out- use ebates. I love this site. You get cash back for online shopping through their site. Example: I recently got 4% cash back on a Sephora purchase online, and 7.5% back on BH cosmetics. If you do a lot of online shopping please create an account through them. I think you get a check or paypal credit every 3 months for what you’ve earned…don’t quote me on that though. Anyway, I hope this blog has been somewhat enjoyable or helpful. If you’re interested in any other affordable products I have in my arsenal, please feel free to make requests on what you may want to see me focus on. Thank you for this 🙂 I do tend to splurge on high end eye-shadows but I just can’t find it within myself to splurge on EVERYTHING that I need to slap on my face each morning. I really want to try highlighter and the ELF primer 🙂 It’s truly amazing how many affordable, cruelty-free options are out there!